Nothing says Christmas Time Cheer like red and white flowers and trimings paired with fragrant, long lasting winter greens. 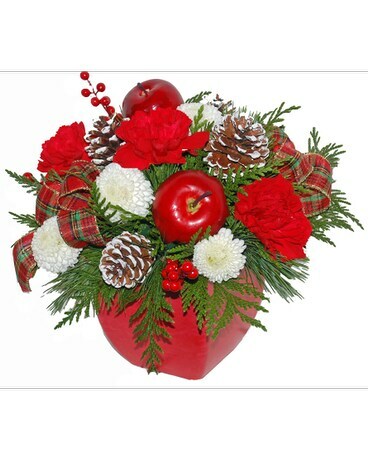 This charming Christmas arrangement includes artificial red apples and berries, white edged pine cones, tartan ribbons, red carnations, white mums and mixed evergreen boughs. Perfect for the holiday table, a coffee table or even an office desk. Send some Christmas Cheer to someone today. Daily Toronto and GTA delivery. Scarborough ON florists. Approx size 22 cm W X 22 cm H. Red bio pot.